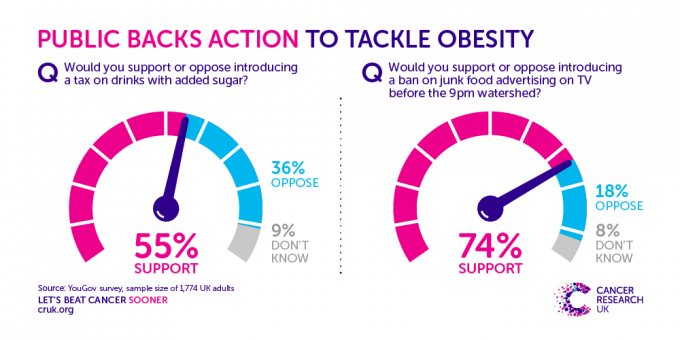 Three quarters of the UK want a ban on junk food advertising before the 9pm TV watershed, according to a new YouGov survey published by Cancer Research UK. The survey of more than 1,700 people found almost seven out of 10 respondents said there should be cuts to junk food advertising online while 66 per cent want reductions in junk food promotions, such as buy-one-get-one-free deals. Alison Cox, director of cancer prevention at Cancer Research UK, said: “Junk food is everywhere. Children are bombarded by advertising tailored to tempt them with pretty colours and cartoons which all influence the food they prefer. At a time when junk food is cheap and packed with extra calories, we need stronger action to help prevent children from choosing these foods.